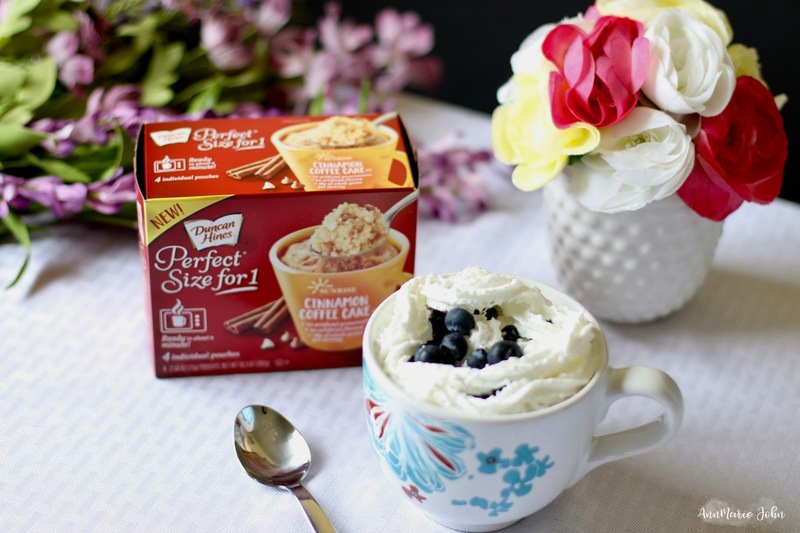 Sometimes you just need to relax and enjoy a warm, delicious treat, perfect sized for 1. How Perfect is That? As a mother of 4 my days can get pretty busy and having a busy schedule isn’t that abnormal these days. From the fast paced work at home life to the parenting responsibilities placed upon our shoulders, it’s no wonder few of us have succeeded in fitting relaxation into our schedule. We often put our needs last on the totem pole, but it’s time to change that. 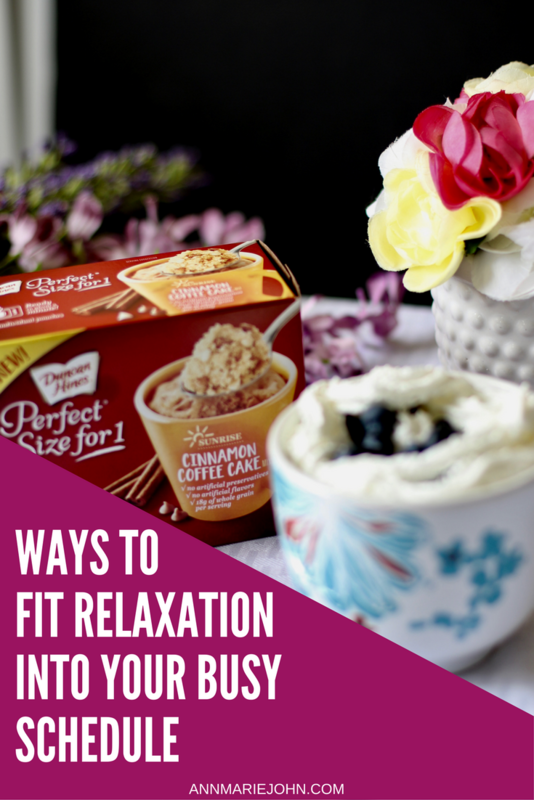 There are easy ways you can fit relaxation into the busiest of schedules and I am going to show you how. I'm also going to be admitting that I'm also the mother who doesn't like sharing her dessert, and these Perfect Sized for 1 treats by Duncan Hines, are so delicious that you won't want to share either. Take a moment to review where you are spending your time. We all have time wasters in our busy schedule. These can be times when we binge watch a show on Netflix or get lost scrolling Facebook. Figure out where you waste time in your schedule and trade those times with some relaxation time. We often say yes more often than we should. Whether you are always saying yes to a friend or helping a family member more often than you should, learn to say no. Now that you have evaluated your schedule to get rid of time wasters, you need to start being committed to just saying no. It’s okay to turn down anything that will take away from your relaxation time. Many work at home professionals neglect to take a regular break time during their work day. Even the average employee has two 15 minute break and a 20-30 minute lunch break in their 8 plus hour work day. Force yourself to take breaks during the day. You can use the two 15 minute breaks for some yoga or meditation. The half hour break could be for a brisk walk. If you can’t take a full break every day, perhaps start focusing on your breathing. A few moments of deep breathing in between tasks can do wonders to relax you. Learn some breathing techniques that people use to calm anxiety, stress and in turn feel more at ease in life. This is a simple relaxation technique any busy person can fit in! This is perfect for work at home professionals, start taking an adult nap. There’s nothing wrong with replacing a break time with a nap. Evaluate your schedule and switch it up in a way that allows you to detach completely from work and electronics to nap for an hour or two. Getting enough sleep helps your mind and body feel more relaxed on a regular basis. Who can say no to a delicious treat, or maybe I should be asking, who can say no to a delicious treat sized for 1? When I mentioned that I hated sharing my dessert, I wasn't joking and these are not meant to be shared! Well you can share them, but you wouldn't want to. With 18 varieties to choose from, you may have a difficult time choosing your favorite. Mine is the Cinnamon Coffeecake! All you need is a mug, some water and a minute, and you can customize it however you want. I particularly like mine topped with whipped cream and blueberries. They are absolutely DELICIOUS! What I especially love about these Perfect Sized for 1 treats, is that there is no mess to clean up. I don't have to get a big bowl and start mixing ingredients, so nothing to clean. No mess and definitely no left-overs! How perfect is that? So take some time out and fit some relaxation into your very busy schedule and enjoy a Perfect Sized for 1 delicious treat. 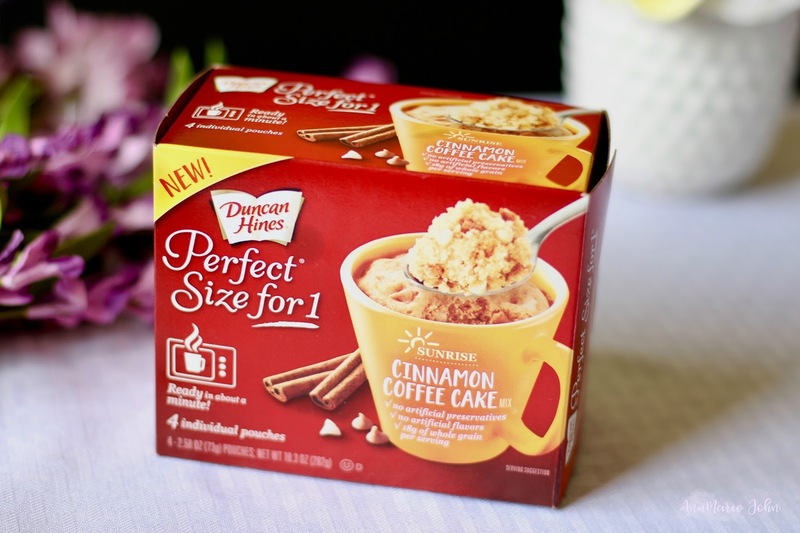 Have you tried the Perfect Sized for 1 treats by Duncan Hines? I need to be better about saying no. I end up taking on way too much and then end up going non stop! This is incredibly clever. 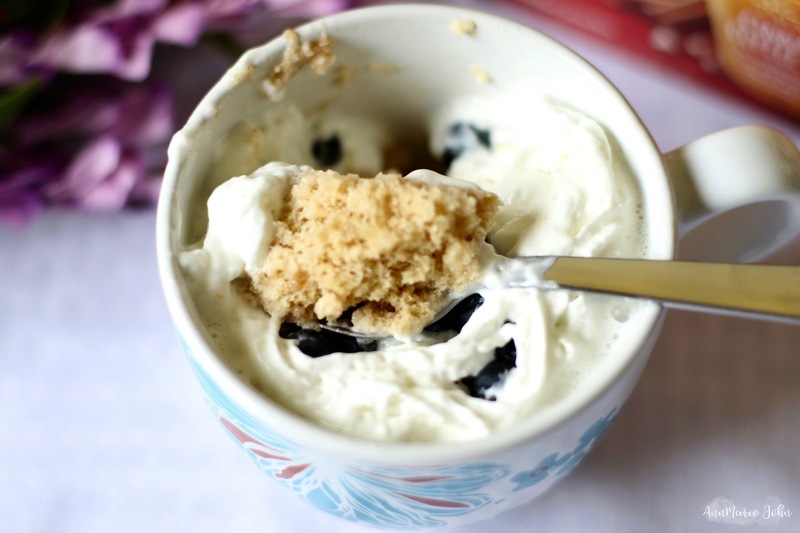 I always see recipes for easy mug cakes, but they never seem to be as good as they could be. I love that Duncan Hines saw this opportunity to make something awesome. Right now I'm doing all of my work outside in the sun. May is as unpredictable as April in Massachusetts. It didn't used to be that way, but we get a lot of cold rain. Today is warm and sunny so I'm outside. I wish I had a coffee cake! This looks delicious! I must get some for myself during my next shopping trip! Thanks a lot for these tips! It's so easy to get caught up in life, that we don't actually stop to take it all in and BREATHE! I haven't seen this as a product. I have a bunch of recipes for mug cakes. It is nice to have something so convenient. What a clever idea rather than measuring and trying to re-create it on your own. I know when I've tried to make these I mess up because I put too much or not enough of the ingredients on my own. I need to make more time to relax! That little individual cake looks SO good too! It would be a perfect "kids are in bed" snack! I love my adult naps. Sometimes I just need a break and to give my mind some time to refresh itself. This sounds so delicious. Talk about a great way to watch portions. I love these tips. It's important to take care of yourself. Which means treating yourself sometimes, these cakes look delicious. I take naps when my kids are napping. Some stuff around the house just waits until that afternoon. I haven't had those snacks before but I've seen them and they look good! This is what I need when I have my short break! This is looks good and tasty. I would love to try it. Great tips! I love these suggestions! I definitely need time to try this! My husband and I are big fans of the adult nap!! I'm a workaholic and usually make sure that I prioritize work over everything. But that's not good for me and my body, to be honest. It's been taking a toll on my health. I think it's important to learn how to take breaks and naps especially when you're body is asking for it. I've never tried that Duncan Hines dessert, I definitely should! It looks so good! These are all awesome tips! I had no idea that Duncan Hines made products to enjoy for one person. How cool. My daughter just bought both of these flavors during the weekend and they were the treat during their movie. It's easy and delicious! These look so yummy! I noticed them in the store the other day! No I never had this before. Wow didnt know this was on the market but looks like a great indulgence. ok i need some of that coffee cake lol, it looks amazing! I am so bad about not taking time for myself during the day. This would be the perfect reason to have a little snack break! I have yet to try Duncan Hines. That coffee cake looks delicious! I have seen recipes for mug cakes and I tried once but failed. I love that Duncan Hines has a prepared mix! Mug + water + mix = delicious cake in mug! I am stocking up on this. Perfect to give me a better mood for those blah days. This makes me happy that Duncan Hines has a single serve mug cake mix! I have been wanting to make one out of scratch, however, I think this would be a better idea! No mess, no fuss, and oh so quick! Stocking up on these! I tried this flavor too and LOVE it! Adding whipped topping and fruit is a great idea. YUM. I take adult naps all of the time. I haven't tried a Perfect for 1 dessert yet, but I would love to see all of the different varieties. Learning to say no is one of the most important skills I had to learn as an adult. It can literally change your life. 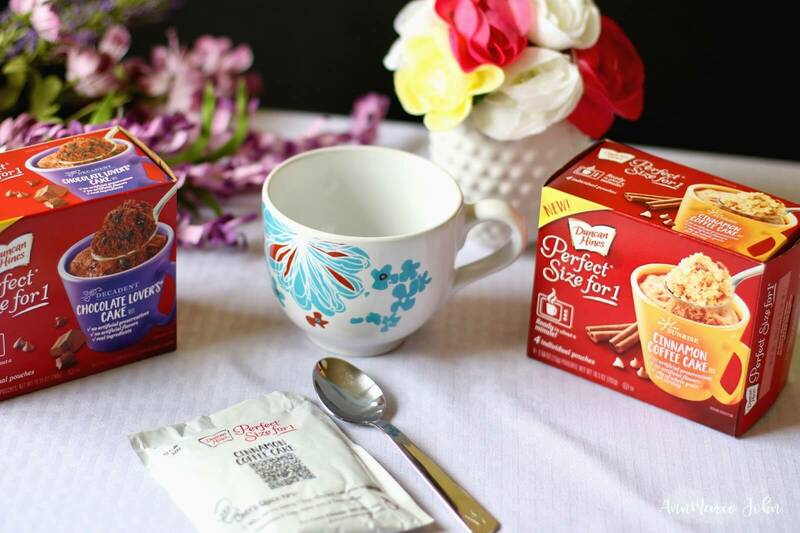 I'm pretty exited to learn about these little Duncan Hines mug cake mixes! We have teens who love to make mug cakes in the middle of the night, and when I get up, my kitchen sometimes looks as if they've been running a bakery for monkeys. These little mixes might save us all a little headache! I love these single entrees for a good ol' me-time! So important to relax! Thanks!